Scroll down for delicious Baked Pork Chop Recipes and other delectable dishes. Heat butter in a large heavy skillet; brown the pork chops on both sides. With slotted spoon or spatula, transfer pork chops to a large shallow baking dish. 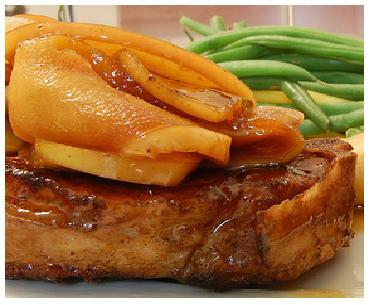 Peel and slice apples, and arrange over pork chops. Pour molasses over the pork chops and apples. To the drippings in the skillet, add flour and cook, stirring, until browned. Slowly stir in the hot water, and cook until bubbly. Add vinegar and a dash of salt. Pour sauce over apples and pork chops in the baking dish. Cover the dish and bake at 350° for about 1 hour. SUGGESTION: Serve with sweet potato and steamed green vegetables, a perfect accompaniment for most Baked Pork Chop Recipes. Put about one inch of water in bottom of pan. Add a layer of chopped onion in water. Add salt and pepper to pork chops on both sides. Add more onions on top of pork chops. When nearly done, remove pan from oven and pour honey barbecue sauce over the meat, spreading evenly. Set oven temperature on Broil. Return pan to oven for about 5 minutes, or long enough to brown the barbecue sauce. Remove pan from oven and serve while hot with fresh green vegetables and steamed white rice. Use a pork shoulder basted with a mixture of water, vinegar, salt, and pepper. Cook the meat slowly over a hickory wood fire until so tender it falls from the bone. Allow about one hour of cooking time per one pound of pork. While you're at it, try this tangy, authentic BBQ sauce recipe from Lexington, North Carolina. This sauce pairs well with most baked pork chop recipes. In a large bowl, mix together cider vinegar, salt, cayenne pepper, red pepper flakes, light brown sugar, and hot pepper sauce. Stir until salt and brown sugar have dissolved. Cover, and let stand at least 3 hours before using as a basting sauce or serving on meat.